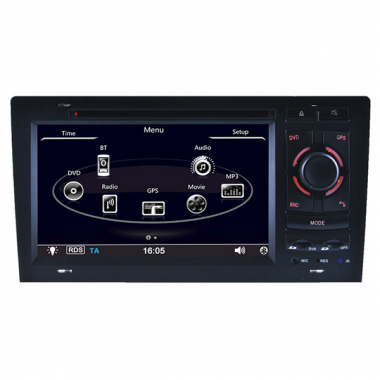 This car DVD navigation is speical for Audi A8, Audi S8 between year of 1994 to 2003. Audi A8 is a luxary car, a mechanically-upgraded, high-performance version of the A8 debuted in 1996 as the Audi S8. Now Audi A8/S8 navigation are both available with windows ce 6.0 system, RAM 11-600MHZ CPU, which performs much better than normal car DVD player with navi system. Audi A8 DVD player has can-bus decode to support steering wheel controls. Buy Audi A8 navigation DVD now get 8GB SD card with GPS maps for free as a gift! If you are lucky enough to be able to drive or own the Audi A8, you will experience a magical driving experience with our audi a8 navigation head unit which has many other great functions.